At a conference this past December, I attended an excellent seminar by a gentleman named Hal exploring the depth of the Hebrew words used in the Aaronic blessing (I want to credit him, but not sure if he’d want his full name used here, so we’ll just stick with first names). This blessing goes like this in the New King James Version: “The Lord bless you and keep you; the Lord make His face shine upon you, and be gracious to you; the Lord lift up His countenance upon you, and give you peace” (Num. 6:24-26). These words are lovely in English, but I was awed by how much more incredible they are when you start digging deep into the Hebrew meanings. In this article, we’re going to take a deep-dive into the words originally used to record this blessing. These words illuminate an encouraging, hopeful message that God continues to share with us today. 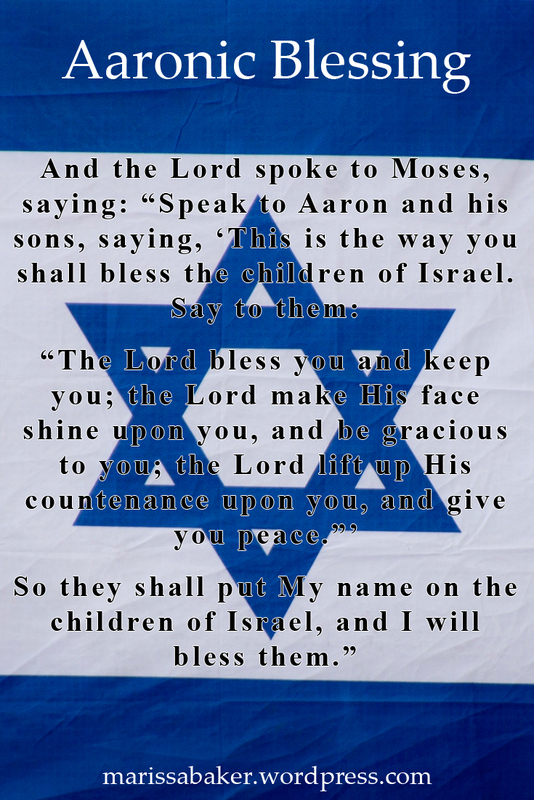 The word “bless” is translated from barak (H1288). It’s meaning includes, “to bless, kneel, salute, or greet” (Baker and Carpenter). In the Old Testament, it means “to endue with power for success, prosperity, fecundity, longevity, etc.” (Harris, et. all). 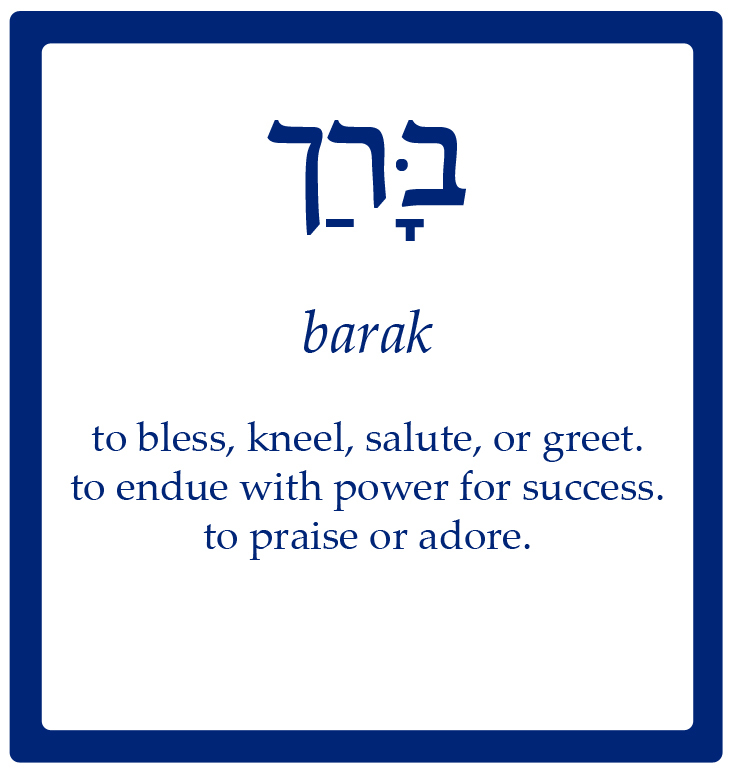 Barak can also mean to praise or adore. We know God promises to bless His people, but I’d never before thought about it in these terms. The Lord adores me? praises me? Really?!? In his seminar, Hal also talked about the meaning “to kneel.” Obviously God wouldn’t kneel to us in the way we kneel to Him in worship. But might He kneel in the way a parent does to get at eye-level with their child? 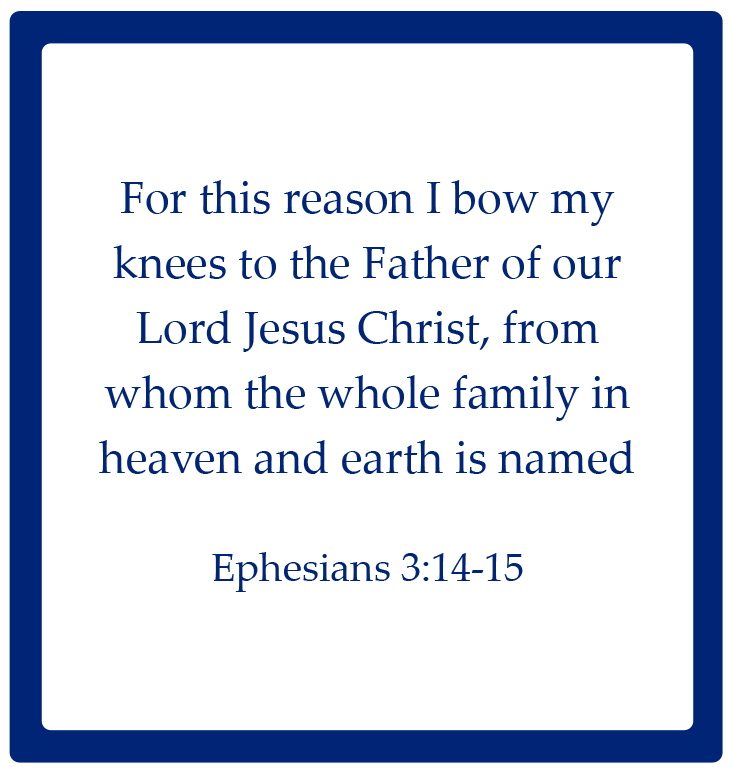 In this sense, we can think of Christ’s earthly ministry as a blessing that He knelt down to deliver at our level. This incredible blessing, delivered by our High Priest, is part of what the Aaronic blessing pointed to — the promise of God’s love always working for our good. The word used when God promises to “keep you” is samar (H8104). This often-used word carries the basic idea, “exercise great care over” (Harris, et. all). It’s closely connected with keeping covenant with God and observing His law. It’s also the world used when the Bible talks about shepherds keeping a flock. Reading Psalm 23 gives a very personal view of this relationship between sheep and Shepherd. 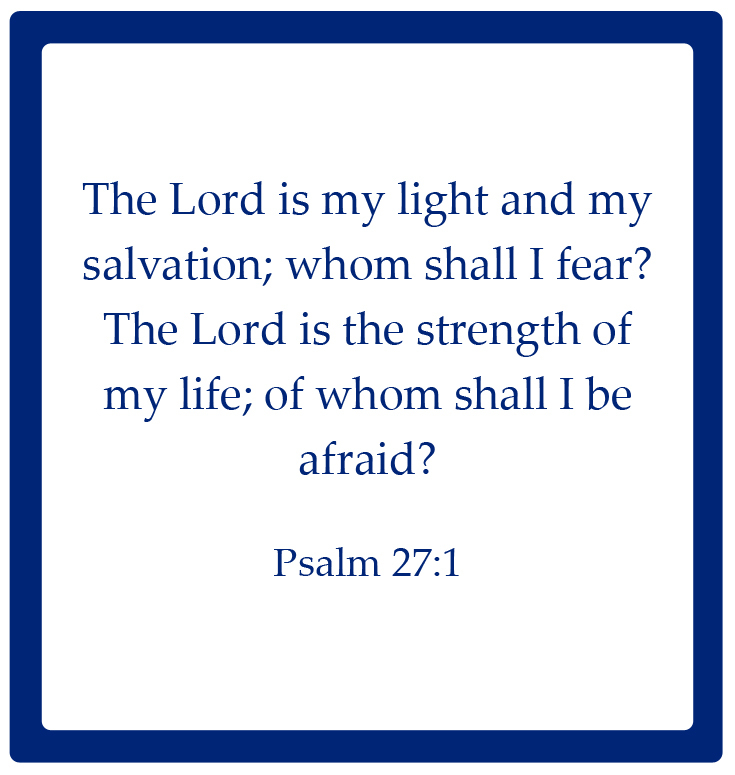 We’re all pretty familiar with that Psalm, but I’d encourage you to go read it again. 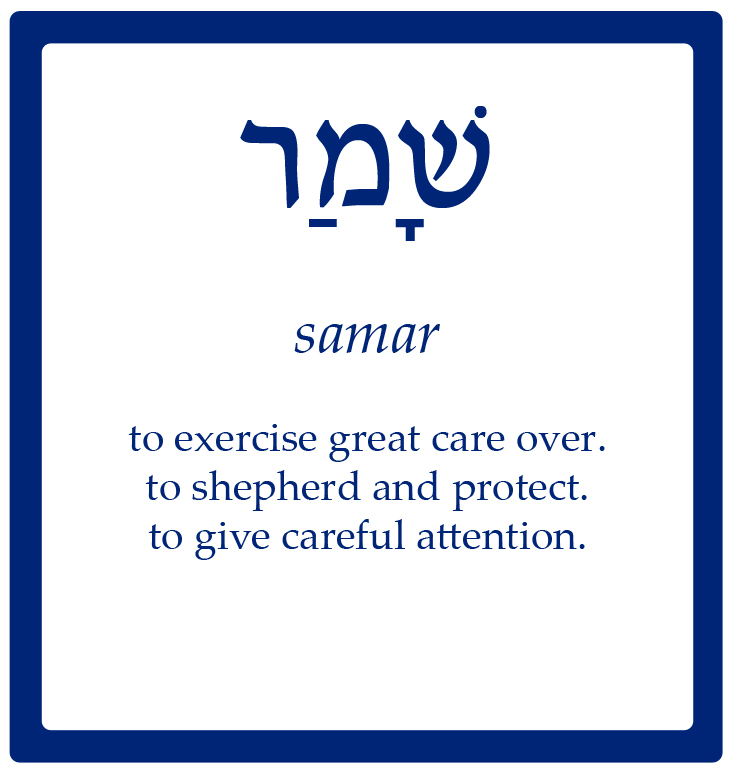 Samar means that God is observing and guarding us closely, giving us careful attention, and protecting us. This sort of care can be physical, but God is primarily concerned with spiritual. When we follow our Shepherd, we’re guarded from things that could threaten our salvation. The word paniym (H6440) literally refers to a face. But it’s more often used metaphorically to include the person’s entire being and attitude as reflected in their face (Harris, et. all). When God’s face is shining on us, His attention is on us with a purpose and direction (Baker and Carpenter). In Hebrew, when your “face shines” on someone it carries the idea of having favor on them and/or being cheerful (Harris, et. all). The word translated “shine” is or (H215), the same as the word for light. Light has very positive connotations in the Hebrew, and is frequently used to describe God (Baker and Carpenter). The Lord is the one who enlightens us. His entire being is invested in favoring and guiding His people. 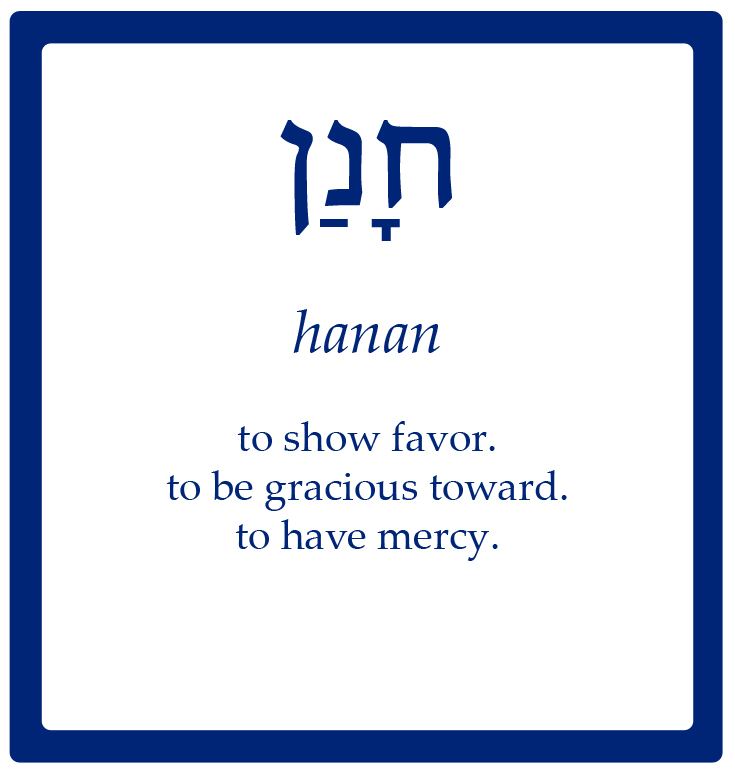 The verb hanan (H2603) “depicts a heartfelt response by someone who has something to give to those in need.” It’s often used of God, and is “an action from a superior to an inferior who has no real claim for gracious treatment” (Harris, et. all). Graciousness the sort of attention from God that made David ask, “What is man that You are mindful of him?” while he marveled at God’s care (Ps. 8:4). Speaking of David, God shows great grace in calling him “a man after My own heart” even though David was a sinner just like the rest of us. None of us deserves God’s favor, or to be called His firstfruits, and yet He still loves us and cares for us so much that He wants us to live forever with Him. When God is gracious to us, He’s showing us unmerited favor. We call this “grace” under the New Covenant and often think of it as something that happened after Jesus died on the cross. But God has been showing grace to His people from very early on (the first use is in reference to Noah), as evidenced by it’s prominent place in this blessing. In this phrase the word “countenance” is translated from paniym (H6440). It’s the same word as “face” in the previous verse. “Lift up” comes from the word nasa (H5375). It has three main meanings: to lift up anything, to bear or carry (especially guilt for sin), and to take away (often of removing sin). The Theological Wordbook of the Old Testament states that the phrase “lift up one’s face/countenance” is “an indication of a good conscience, confidence, favor, or acceptance.” Here in the Blessing, the most obvious meaning for this phrase is that God accepts us. Perhaps it goes a bit deeper, though. Remember in our first discussion of paniym, we talked about the face as a stand-in for the entire person? 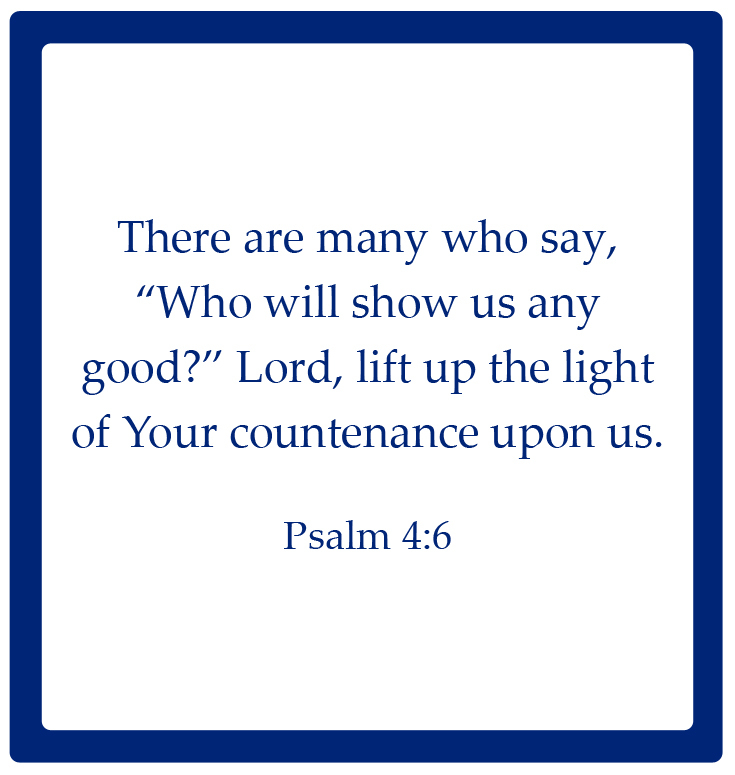 Suppose this phrase, “lift up His countenance upon thee” involves God taking us into His presence. In the Old Testament, the phrase “appear before [paniym] the Lord” can literally be translated “to see God’s face.” Though we can’t actually see God in His glory now as human beings, He’s offering the great blessing of coming into His presence. This carries even more meaning under the New Covenant now that Jesus’ actions in taking away our sins (which is one meaning of nasa) have removed the separation between God and His people. Shalom (H7965) is probably the most familiar Hebrew word to non-Hebrew speakers, yet there’s more too it than we usually think. It’s deeper than peace as an absence of strife or a simple greeting. 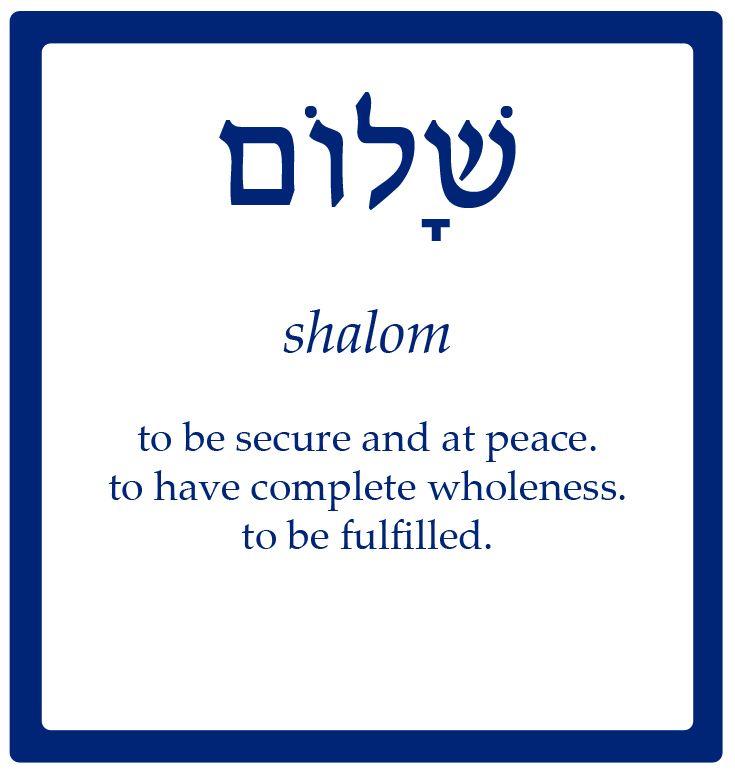 The concept of shalom involves “the idea of unimpaired relationships with others and fulfillment in one’s undertakings.” “Completeness, wholeness, harmony, fulfillment are closer to the meaning” of shalom than our English word “peace” is (Harris, etc. all). True shalom always has its source in God. It’s not surprising, then, that the word translated “give” here in the Blessing is connected with the Lord’s actions as Creator-Redeemer. Sum (H7760) basically means to put or place something somewhere. It’s often used of God actively doing something, including placing Adam in the Garden and putting Abraham in a covenant (Harris, et. all). When used in this sense, the verb “indicates God’s sovereignty over all creation, especially that of human kind” (Baker and Carpenter). In Hebrew thought, a name isn’t just what you call a person. It denotes their entire reputation. We use this in English to a certain extent when we talk of someone having a “good name” or a “bad name.” So when God puts (the word is sum) His name on someone, He’s marking them with His character and reputation. Being called by God’s name shows that we belong to Him. In the New Covenant, we’re grafted into His people Israel and we’re adopted into His family. We all carry His name and reputation with us when we live as true Christians. Yahweh adores you and praises your efforts. Yahweh invincibly guards your salvation. Yahweh surrounds you with His presence, and rekindles and illuminates your heart. Yahweh has great and gentle compassion. Yahweh carries you in His embrace. Yahweh fills your life with security, tranquility, and healing. Yahweh grants that His victorious children should also have His glorious name and reputation. Isn’t it incredible to see the layers of Hebrew meaning written-out like this? to see all we’ve been studying distilled into this form, and think of the glorious love the Father has for us revealed in His blessing over the children of Israel. Knowing I’m a writer at the end of his seminar Hal suggested I also try writing a paraphrase of the Aaronic blessing. I decided to go a slightly different direction than he did. My goal was to find a sort of “middle ground” — conveying more of the Hebrew meaning while maintaining a format that was easy to read aloud and reflected the organization that appears in most scripture translations. This is the way you shall bless the children of Israel. Say to them: “Yahweh adores you and gives you power to succeed and prosper; He cares for you as a shepherd does His sheep; Yahweh devotes His entire being to showing you favor, and gives you undeserved grace; Yahweh welcomes you into His presence and, with His authority as Creator, places you in complete fulfillment.” And they shall put my name and glorious reputation upon the children of Israel, who are My family, and I will bless them. Warren Baker and Eugene Carpenter. The Complete WordStudy Dictionary: Old Testament (AMG Publishers, 2003). R. Laird Harris, Gleason L. Archer, Bruce K. Waltke. Theological Wordbook of the Old Testament (Moody Publishers, 1980). Zachi Evenor “Flag of Israel.” CC BY, via Flickr.